To set the power supply's output voltage, output current, over voltage trip (OVT), and over current trip (OCT) values from a computer, the power supply first needs to be set to REMOTE mode. The power supply can always be monitored from any interface, but the set point modes ROTARY, KEYPAD, EXT PGM, and REMOTE change where the power supply receives its voltage, current, OVT, and OCT settings. INT CTL should be enabled to Start and Stop the unit via the front panel, while EXT CTL should be enabled to Start and Stop the unit externally when using the JS1 37-pin analog-digital I/O connector or REMOTE mode. This article describes how to put the power supply in REMOTE mode from a variety of different interfaces. While the product is in Standby, press the MENU button. Press the Item button until CONF appears in the DC voltage display. Press the Enter button. At this point you should see REM SEN flashing. Press the Item button until REMOTE is flashing and then press Enter. You should now see REMOTE illuminated and not ROTARY. There are multiple ways to set the unit to REMOTE mode from the RIS Panel software. First, however, communication needs to be estalished with the product. Download the RIS Panel software from Magna-Power's support downloads. Open the RIS Panel software. An error will appear "Device not Found. Entering Simulated Mode!" Click OK which will give you access to the RIS Panel. Under the Communication drop-down, select Setup. Select the correct system type. For example: XR Panel for XR units or A Panel for TSA, MSA, or MTA units. Select the correct type of communications and port/address setting to reflect how the computer is connected to the product. For example: RS232, or TCP/IP. Click OK after finding and establishing communication between your computer and your power supply. The error "Device not Found. Entering Simulated Mode!" should not appear. The Virtual Control Panel replicates the state machine of the power supply. Follow the same steps from "Setting Remote Mode via the Front Panel." After establishing communication with the power supply, click the View drop down menu and select Command Panel. On the bottom left field, type 3 into the Setpoint Data box and press Set. This will set the power supply into REMOTE mode. Verify the power supply has received the command by pressing Get next to Setpoint. Figure 1. 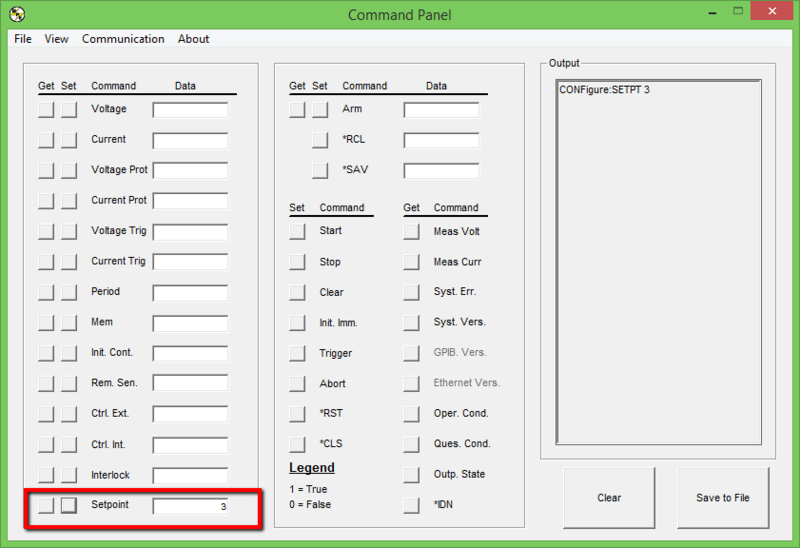 Configuring Remote Mode with Magna-Power's RIS Panel software. The power supply can also be configured for REMOTE mode programmatically via software control by issuing a simple command: CONF:SETPT 3. This is command is typically issued as part of a software initialization routine to configure the power supply. Concevoir et fournir des solutions robustes en conversion d'énergie, construites aux Etats-Unis selon les normes qualité les plus sévères grâce à une intégration verticale de la production. © 2019 Magna-Power Electronics, Inc. All Rights Reserved.